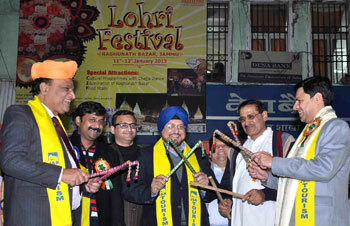 Jammu (JAmmu & Kashmir) Januray 11 - Department of Tourism organized 2-day Lohri Festival at Raghunath Bazar Jammu here today in which Divisional Commissioner Jammu Pardeep Gupta inaugurated the Lohri festival with the lighting of auspicious lamp. The festival is being organized by the Tourism Department in collaboration with Raghunath Bazar Businessmen Association to showcase the cultural heritage of Jammu. Speaking on the occasion, the Divisional Commissioner said that organizing such type of events showcase the unique cultural ethos and heritage of Jammu besides promoting cultural tourism in the State. He informed that the government has taken several steps to diversify the tourism activities under which potential destinations are being developed across the state to promote eco, adventure and heritage tourism. Other attractions of the Raghunath Bazar were ethnic food stalls, cultural show with Chajja dance, playing dandia and illumination of Raghunath Bazar. Lohri Festival function will also be held at Raghunath Bazaar on 12th January in which Cultural items and Bonfire will be the main attraction. Among others, District Development Commissioner Jammu, Director Tourism, Joint Director Information, Jammu, President Raghunath Bazar Businessmen Association and other officers of Tourism and other departments besides members of Raghunath Bazar Businessmen Association and large gathering was present on the occasion. 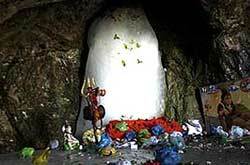 Jammu, the City of Temples - Raghunath Temple, Bave Wali Mata, Ranbireshwar Temple, Panchbakhtar Temple, Peer Kho, Mahamaya Temple dot the skyline of Jammu.